In 2010, a gunshot crushed Iraly Yanez's dreams of finding a job as a dancer. The bullet struck Yanez as she entered her home, just outside Caracas, Venezuela. It damaged two vertebrae in her backbone, leaving her unable to walk. Today the 34-year-old Venezuelan requires a wheelchair to move around. But now, she is working toward her goal of becoming a professional dancer, thanks to a dance company that helps physically disabled individuals perform. The company, AM Danza, works with 50 young Venezuelans with disabilities, such as broken spines, cerebral palsy, Down syndrome or blindness. Yanez joined the group in September. She recently performed in her wheelchair in an hour-long show in one of the most celebrated theaters in Caracas. After the performance, Yanez spoke with the Associated Press (AP). "This is the opportunity of a lifetime," she said. "I can't allow external issues to affect me any longer." During the show, disabled dancers performed with fully-abled professional dancers to show that art knows no limits. Some of those watching the show cried. Dancers with limited movement in their legs lifted the crutches supporting them in the air all at once. 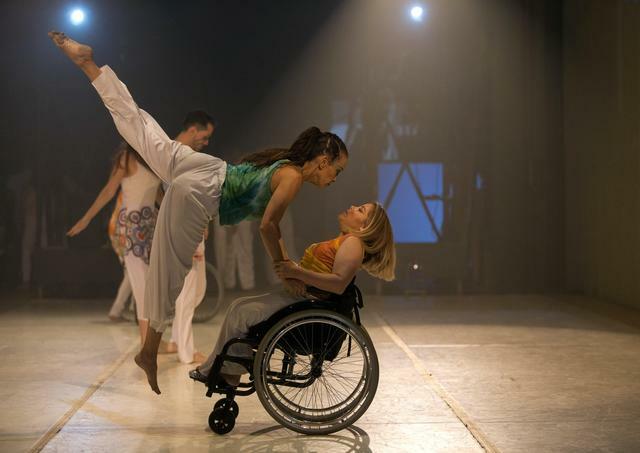 One dancer lifted Yanez from her wheelchair and above her shoulders to perform complex moves. Alexander Madriz is the director of AM Danza. He told the AP, "Dancing is all about passion. You have to enjoy your possibilities and use your body to express emotions." Madriz has worked for over 20 years with dancers who have disabilities. He says that thanks to them, he has learned that body expression has no limits. "Not everything has to be the perfect lines and symmetry that you see in contemporary classical dance," he said. Madriz said that the students' love for dance has helped them overcome the many difficulties faced by disabled people in Venezuela. Public transportation in the country is especially difficult for people in wheelchairs. There are few ramps on sidewalks and near public buildings to assist them. And like everyone else in Venezuela, the disabled have to deal with shortages of medical supplies and inflation that affects their wages. Yanez has a difficult time during the week getting transportation to the place where AM Danza trains. She says she can spend up to three hours waiting for one of the few wheelchair-friendly buses that pass through her neighborhood. But that does not seem to decrease her willingness to practice. She said that the dance company has been a positive influence on her life. She added that performing with the group makes her feel like she can now "fly through the sky." Yanez said that she is looking forward to dancing in more performances. He stood up and began to move around the room. Thanks to that job I became an avid reader. I recognized his voice at once. The purpose of the occasion was to raise money for medical supplies. 5.And like everyone else in Venezuela, the disabled have to deal with shortages of medical supplies and inflation that affects their wages. 6.Yanez said that she is looking forward to dancing in more performances. The day we have been looking forward to has come at long last. He was looking forward to working with the new Prime Minister.